Image of cellular automata Sierpinski Triangle generated byJason Michael Ada. Source Code (Python) used to generate this image. "Cellular automata are the simplest models of spatially distributed processes. They consist of an array of cells, each of which is allowed to be in one of a few states. At the same time, each cell looks to its neighbors to see what states they are in. Using this information each cell applies a simple rule to determine what state it should change to. This basic step is repeated over the whole array, again and again". The "game became widely known when it was mentioned in an article published by Scientific American in 1970". In Conway's Game of Life, "life has only two states, 1 and 0, standing for "living" and "dead", respectively. The transition rule is also simple. You look at all eight cells immediately around you. If less than two of your neighbors are alive, you die. If exactly two of your neighbors are live, you don't change. If exactly three of your neighbors are alive, you will be alive next turn, regardless of your current state. If four or more of your neighbors are alive, you are over-crowded and you die". "It turns out that the number of interesting configurations you can make from these elements is immense: things which blink and oscillate; things which glide across the plane; things which eat the gliders; things which throw off the gliders like waste". Pattern Dormation by Cosma Shalizi. Created 26 Dec 2010 18:38. University of Michigan. Self-Organization by Cosma Shalizi. Created 03 Dec 2010 08:00. University of Michigan. 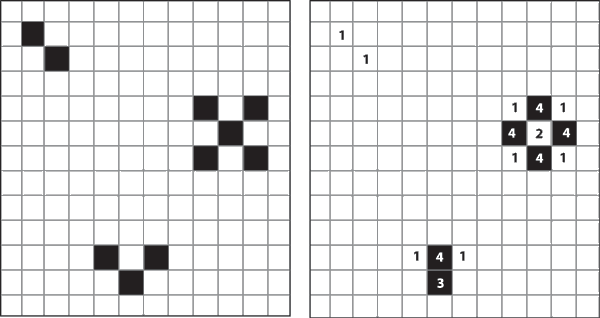 ↑ Cellular Automata (1947-present) from the CompLexicon © The Exploratorium, 1996. ↑ Introdution to One-dimensional Cellular Automata David J. Eck, Hobart and William Smith College Math Department. ↑ Mathematical Games: The fantastic combinations of John Conway's new solitaire game "life" by Martin Gardner. Scientific American 223 (October 1970): 120-123. 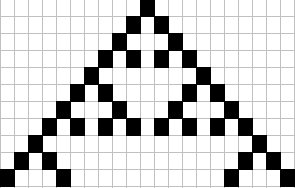 ↑ Cellular Automata by Cosma Shalizi Created 25 Oct 2010 04:50. University of Michigan. This page was last modified on 16 June 2011, at 20:08.